Coalition airstrikes for July 2013 are about half the total of July 2012 and the lowest for that month since at least 2008, continuing a drop in airpower in Afghanistan. U.S. Air Forces Central Command early today released this month’s airpower statistics, showing 253 total weapons releases in July, compared to 504 in July 2012. That brings the total weapons releases for this year up to 1,973, with 951 total sorties with at least one weapons release. Intelligence, surveillance and reconnaissance sorties continue at a high pace, with 15,160 so far this year. Casualty evacuation sorties are also low this year, with 357 total so far this year with 130 total saves. The release still does not include weapons releases from remotely piloted aircraft. An Air Force Times Freedom of Information Act request for that information is still pending. 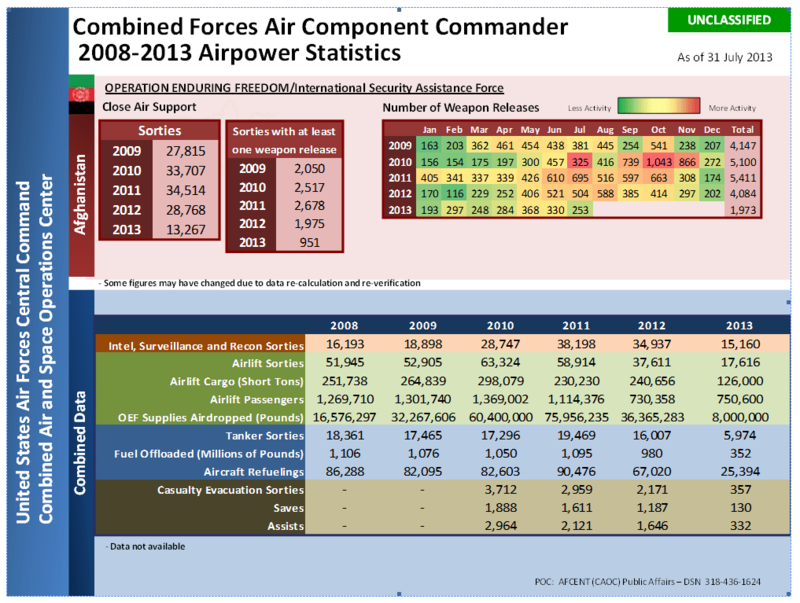 Shortly before announcing the monthly statistics, AFCENT published a release touting increased Afghan operations. On July 23, Afghan Mi-17 and Mi-35 pilots, flight engineers and gunners launched the largest combat arms operation in 30 years, called Operation Seemorgh. In the operation, eight aircraft helped the Afghan National Army support troop movement, resupply and casualty evacuation, according to an AFCENT release.